Via reddit, I found this interesting. I simply cannot see that fully automatic M14 being controllable by anyone, and by any stretch of the imagination. And why would you have a fully automatic M14 that is magazine-fed, only to interrupt fire to change magazines? To me, an M249 SAW (fed with drums) is a much better weapon for the purpose. On the other hand, if all you have is the M14 series of guns, having one capable of selective fire isn’t a bad idea. It’s just inferior to the SAW. As an engineer, you probably know the folly of design-by-committee better than most. 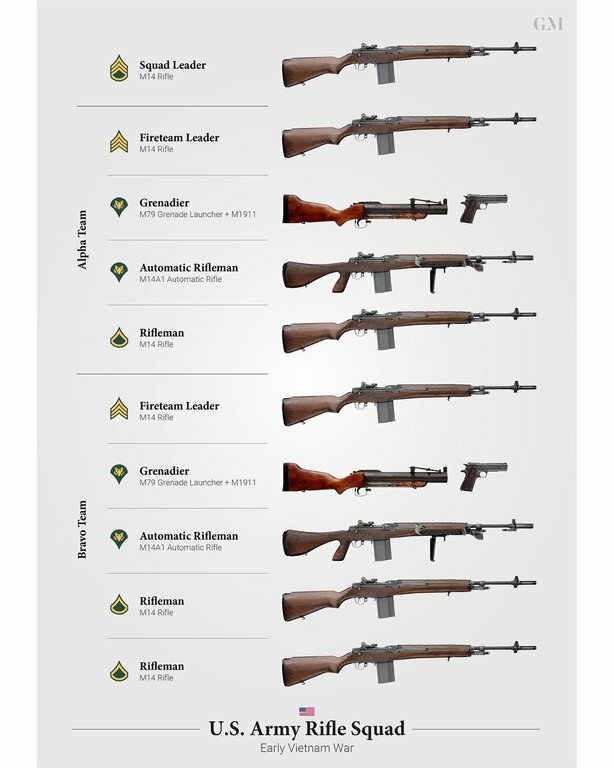 The M-14 program was hamstrung from the very beginning by the ludicrous and utterly unrealistic requirement that the new weapon replace not only the M-1 Garand service rifle, but a whole range of other weapons, including some chambered in an entirely different class of cartridges than the new 7.62×51 NATO round intended to replace the 30-06. In addition to the Garand, the M-14 was tasked with replacing the Browning Automatic Rifle, which also fired the same 30-06 cartridge as the M-1 Garand; Thompson and M-3 “Grease Gun” submachine guns, both of which fired the .45 ACP pistol cartridge; and the M-1/M-2 Carbine, which fired the .30 Carbine cartridge. The new service rifle was being asked to replace three entirely different weapons systems than the M-1 service rifle – and to fulfill the functions of SMG, automatic carbine/assault rifle, and squad automatic weapon/automatic rifle – in addition to being a service rifle. I don’t know what the good folks down at the Army Ordnance establishment were drinking, but apparently it was some good stuff, because no sober man dreamed up those requirements! Given all of the extraneous baggage that accompanied the program to develop the M-14, it is nothing short of miraculous that the final product, the rifle itself, ended up being as good as it was. As for its failure to be an acceptable SAW, that fate was shared by its foreign counterparts – the FN FAL and the CETME/G3. All were chambered in 7.62 NATO and none was easily-controlled on full-auto. And like the M-14, none was designed to function as a GPMG. In fairness to its critics, the SAW version of the M-14 was intended to be fired primarily from the prone position using a bipod. When standing, slung not unlike a BAR, about waist high. Because so few men could handle sustained automatic fire from the shoulder position, good training was essential – short, controlled bursts which aided keeping the rifle on target and allowed the barrel to cool between strings of fire. This weapon was, like the BAR, a true automatic rifle – it was not designed for protracted use on fully-automatic fire. Since it lacked the option of a quick-barrel change in the field, sustained fire over too long of a period could burn out the barrel and render the weapon inoperable. The original intent of the M-14 program was to improve upon the BAR, but the designers ended up treading water, perhaps even regressing. As heavy as the BAR was, it was still a well-liked and effective weapon as late as the Korean conflict. If it was employed as its designer intended – as an automatic rifle – it performed well, and when push came to shove, no one complained about its stopping power and range. Interestingly, Fabrique National designed and produced a variant called the BAR Mle.D or simply the BAR-D, which made good the most-common complaint about the design – its lack of a quick-change barrel, which limited the weapon’s employment as a base-of-fire weapon. A version was later designed post-war for use from a tripod and to use the same magazines as the FAL and in 7.62 NATO, but had few takers by that time. American designers and planners, perhaps unduly influenced by the long career of the BAR in U.S. military service, designed in the select-fire M-14 another true automatic rifle – when what was actually needed was a true general-purpose machine gun, like the German MG42. Not until the introduction and adoption of the FN M249 SAW did American troops have a true squad-automatic weapon, one capable of feeding from boxed or belted magazines as well as stanag M-16 mags, and of operating from the shoulder, bipod, tripod or slung. It also had a provision for a quick-change barrel and other useful features. The needs of the infantry fire-team, squad, and platoon are best-served by having a variety of weapons, each properly-designed to fill a specific niche or mission requirement. This old-school wisdom has been lost on the post-Vietnam military, which continues to waste money, time and effort searching for a “universal weapon” that can do everything. Provide the infantryman with a variety of weapons from which he and his NCOs and officers can choose when it is time to arm-up for a mission. Make sure that all involved have the necessary training to use the weapons and employ them properly in the field – and then get out of their way and let them do their jobs. We can also take a page out of the book of the hard-won experience and knowledge of our best special ops warriors – and allow our troops to arm themselves with non-standard and/or foreign weapons when such is called for and appropriate. One final comment pertaining to the diagram shown with the story. I know a handful of Vietnam combat veterans of the Marine Corps and U.S. Army, guys who were grunts and saw a lot of fighting in that war. Several Marines, one Army veteran of the 101st A/B Division, and a FMF Corpsman who spent a lot of time in the bush with Marines on patrol. I had occasion at a party about a decade ago to ask these guys about their individual weapons in Vietnam and what they thought of the M-14 and the M-16. To a man, all of them spoke highly of their M-14s (the Corpsman didn’t carry one, but liked it anyway), and how they hated to turn them in for M-16s. Small sample size, I know, but that’s what happened. Your son is a Marine, so you are probably well-versed with how creative and colorful seasoned combat soldiers and Marines can be with blue language about things they disdain and don’t like. They called the M-16 a “poodle shooter,” “that ‘Mattel gun’,” and it went downhill from there. Interestingly, the son of the paratrooper comes over to have a beer with us, and he’s a fellow grunt, too, a paratrooper just like his Dad and recently returned from a tour in the sandbox. We asked him about his weapon in Iraq and how he liked it, and he had nothing but good things to say about his issue M-16. Twice the U.S. Army rejected true intermediate cartridges. The .276 Pederson before WWII and the British .280 after. Either of them would have been a better do-it-all cartridge for a rifle squad and eventually a belt-fed machine gun could have been designed for it instead of the SAW and the M60. Funny to me that shooters today talk about 6.5mm rounds like they were just invented. I was in basic ROTC from 61 to 63, and we were informed that the new weapons would be a selective fire M14 (we got one to look at) and the M15. The M15 was supposed to be the replacement for the BAR, and it had a quick change barrel. Whatever happened to the M15? By the way, an M60 would be a good replacement for the SAW, as good as the SAW is. The M60 would give a platoon controlled fire out to 1,000 yds. Knowing someone who has a (Tax-Stamped) M-14, I found Him one of those -A1 Pistol-Grip Stocks, and we played around with it to see if it made the M-14 “More Controllable” in Automatic Fire… Not. The Weapon is just Too Light to control in Sustained Auto Fire, even with the Bipod and that Forward Grip to Hold it Down. It takes a lot of Practice to learn to fire Short Bursts and Hit a (large) Target beyond 300 Meters, making it a “Brush Beater” at best. But the M-14/M-1A in Semi-Auto is still a great .30 Caliber Battle Rifle. is Spot-On and needs to be Beaten Into the Heads of those “Ordnance Officers” who sit around selecting Weapons they themselves Won’t be Using. ….And Bring Back the Blank-Fired Rifle Grenade, in an Atomic Version. Would Solve a lot of Problems on the Battlefield. Have read and heard over the years of the various faults of “The Pig,” a.k.a. the M-60 – runaway and out-of-control automatic fire, parts that can be installed backwards, and so on. Being an outsider with his nose pressed against the glass, I can’t speak to them the way the guys who used them can. Were those defects real? Were they satisfactorily fixed? I would guess probably so since the M-60 is still in service. Knowing the history of that weapon somewhat, how it was supposed to incorporate the best features of the MG42 – I can’t help but wonder why we didn’t just swallow our pride and adopt that design instead in its modern incarnation – the Rheinmetall M3 7,62×51 NATO. At least we were smart-enough to buy some FN MAGs – the design being one of the finest GPMGs ever designed, according to those who favor them. LOL- are non-military personnel allowed to laugh at military-type humor?! I roll my eyes when the supposed logistics experts try to explain why we need 1 universal small-arms round. We had a several different small arms rounds in WWII – when our logistics chain wasn’t managed with computers and didn’t have jet cargo aircraft – and I don’t recall ever hearing about Americans losing a battle because they ran out of .30-06, .30 carbine, or .45ACP rounds. Yep, me too…. those guys (our forbearers) managed the longest supply chain in history – from CONUS to places like Okinawa and Burma and Germany – and kept our GIs better supplied than the enemy kept their personnel, even though the enemy were, in relative terms, just around the corner from their logistical base. And the arsenal of democracy, so-called, managed this stupendous feat without modern computers, microprocessors, the internet or any of the other 21st-century marvels people take for granted today. The “Can Do” spirit of Americans in that time was quite something to behold! that Fired a 2-Kiloton Fission Round (the “Atomic Watermellon”) out a few Kilometers, unfortunately ‘Danger Close’ for the Gunners. I Suspect that left to go in that Direction, the Weapons Physicists could have cut it down to Rifle Grenade size, eventually. As for the MG-42, I was once at a “Shoot” where someone had one of those, and it was Seriously Impressive- Mechanical Work of Art and Fast- don’t remember the RPM but it made an M-60 seem like “Bump-Stock”. And the Pig Jammed a lot, too. The thing that Impressed Me the most was how when the MG-42 came out, all the WWII Veterans just Disappeared- even though they were “Uprange” from it…. Great comments above. Great image. – both systems in the same intermediate-caliber (6.5mm – 6.8mm) cartridge. – plus a grenade launcher – like the old M79 – that is not integrated with a rifle (the M203 is excessively awkward); give the grenadier a 10mm subgun or a 10-inch version of the 6.5/6.8mm battle rifle for his close-in protection (or a pistol). The 7.62x51mm weapon should only be the general-purpose machine-gun (GPMG) role at platoon or company level. Given the politics that drove the 7.62x51mm NATO cartridge selection – rather than the British .280, and the McNamara-esque “one-size fits all” (I don’t know that McNamara had anything to do with the directive that the M14 project had to fill the battle-rifle and LMG role with a single rifle, but he did the same crap with the Navy and Air Force aircraft selection) – I say, given all that, the M14 is an excellent design. I have fired the BAR; I have fired the M14 – nothing in .30-06 or .308 WIN is controllable in full auto, burst or even very rapid semi-auto, unless off a bipod and firmly planted. That said in the ’50s we ought to have gone with an intermediate cartridge to replace the .30-06/M1 system. We screwed that opportunity up. We had a second opportunity in Vietnam to get a true intermediate cartridge, in the 6.5mm to 7mm range, with twice the bullet weight as the under-performing 5.56mm – and we screwed it up again. Hopefully we will finally get it right. P.S. The M249 SAW is not a great LMG; it is bulky, heavy and awkward. And it is very easy to cherry the barrel and burn it out in short order because those 200-round belts of ammo are just so fun to shoot all in one go. I saw this happen too many times. For the squad LMG I want a G3, slimmed down to the aforementioned intermediate 6.5mm or 6.8mm cartridge. My son was a SAW gunner (in addition to a DM) and loved the weapon. He was assigned to teach the company how to do it right. It’s all about knowing how to control your fire, and when you can do what concerning the bursts. He was quick to get the “feel” of the gun. I think in the end it’s all about training and skill and time in grade rather than the gun itself. Herschel: Thanks for the response! You are absolutely correct – the M249 SAW is fun and easy to shoot; it is also very controllable — by anyone trained and interested in doing it right (which is rather less often than not). The problem is that – for the 5.56mm cartridge – it is overly heavy and bulky, and therefore awkward to maneuver with. For the squad and fire-team, if I can’t have a slim, relatively light G3-clone in 6.5-6.8mm, then it would be better to only have an automatic rifleman, like the USMC M27, as opposed to an 18.5lb SAW (that’s without ammo, as I recall). But what is the SAW equivalent going to weigh when up-gunned to a true intermediate cartridge, say 6.5mm Grendel? It will be more; and it will still be awkward to maneuver with at the squad or fire-team level. In other words, while it is a great design and a great shooter, it isn’t handy. An 18.5 lb. SAW in 5.56×45 NATO? That’s pretty darned heavy for a weapon which only fires a .224-caliber round. The BAR M1918 Automatic Rifle, which fired a much larger 30-06 cartridge (7.62×63), weighed less at 16 lbs. – and hit a lot harder and at longer range, albeit with less firepower in terms of rounds on target. It’s been a century, and our firearms designers and military men still haven’t managed to surpass John Moses Browning! Well, the man was a genius, after all…. but seriously, this is the best we can do? There are still BREN guns in service in various bush wars in Africa, rechambered for 7.62×51 NATO rather than .303 British, but that too is a venerable firearm. Maybe designing the ideal squad automatic weapon isn’t as easy as we think – or maybe those long-ago designers knew more than they’ve been given credit for knowing. Another idea from the past perhaps worth revisiting – the slow-versus-fast automatic fire settings on the BAR. Most users of that weapon found it more-controllable on the slower setting, not surprisingly, and its use conserved ammunition and allowed the weapon a bit extra time to cool between shots. Given the propensity of young men to push the limits of things, maybe this is an idea whose time has come again. Fire discipline, however, is first and foremost a training issue, not a technology issue. If the guys in your fire team, squad, platoon, etc. are not exercising good fire discipline, then there is a problem which needs addressing by that unit’s leaders. Allowing for the fact that green, inexperienced and/or frightened troops will lose fire discipline more-readily than blooded, toughened and combat-hardened ones, that is. It is also a doctrinal issue. For decades prior to the Vietnam conflict, the U.S. Army and Marine Corps alike stressed the importance of mastery of the individual infantryman’s weapon – his rifle. The Marines, in particular, were famous for this, but the Army didn’t do a bad job of it, either, back in the old days. Aimed and disciplined fire, not spray-and-pray, was SOP. However, with the advent of assault rifles, SMGs and fast-firing crew served automatic weapons, that approach was replaced by massed firepower. It was felt that a sufficient volume of fire headed downrange was enough to keep the enemy’s heads down and inflict sufficient casualties besides. However, this is contradicted by the historical data, which have shown a steady increase in the number of rounds expended per enemy KIA – since the time of WWI a century ago. By Vietnam, it as taking 50,000 rounds fired for each enemy killed in action. Like the man said, firepower isn’t rounds fired, it is hits per number of rounds fired. I have that huge book on the FAL, which includes quite a bit about how the M14 was thrust into being. If I recall correctly, a single man, a Lieutenant Colonel, put the kibosh on the FAL even after FN had redesigned it for the 7.62NATO round. Despite the fact that the FAL was designed by a John M. Browning protege. Sad story. While I don’t think the FAL was a good candidate for full auto, area suppression fire, it was a major improvement over the Garand upgrade, which the M14 was. The AR series, small and large frames, are huge improvements over the M14 and and an improvement over the FAL as well. The individual in question was the late Colonel Rene L. Studler, U.S. Army (1895-1980). When I researched him, I rather expected a bureaucrat in a uniform, but it seems he was more than that. Studler joined the Royal Canadian Air Force at the onset of WWI, but switched to the U.S. Army Flying Corps when America entered the war. Studler held a bachelors degrees from Ohio State University and a masters degree in engineering from MIT. During the 1930s, he served in various billets in Europe as a military attaché, including postings in Britain, France and Germany. From 1940 onward during his military career, he resided primarily in the Washington, D.C. area, where he worked primarily on the development of weapons and ammunition. Before retirement in 1953, his final assignment was as chief of small arms research and development for the War Department and then the Department of the Army. In retirement, he served as a consultant on weapons development and design for the Army and Air Force, as well as in the private-sector defense industry. He retired a second time in 1978. A devoted horseman, Studler was active in equestrian events in the Washington area. Perhaps I am a heretic, but I find that both the FAL and M-14 have positive attributes – both are, IMHO, excellent designs with much to recommend them. Studler was typical of the type of individual who ran things around that time in military circles, i.e. born in the late 19th century and very much products of their time. It is not uncommon for large bureaucracies to be conservative in terms of their tolerance for change and for new and different ideas. Nor would it have been unusual for a man like Studler to have been that way. I don’t believe the real “boat missed” was the FN FAL, but instead the Armalite AR10. But if Studler found the FAL too new and different for his likely, I don’t imagine that he would have taken the then-futuristic looking AR10 any more seriously than the Belgian design. And fate intervened vis-à-vis the AR10, as it was not ready for the trials and performed badly against its competition. Recall, too, that in Britain and the U.S. alike, assault rifles had not yet caught on in the way that they had in Germany and the USSR. The Anglo-American allies had won the war largely using weapons designs not of the 1950s, but of the 1930s – and it would take them some years to catch up to what German and Soviet small arms designers were doing during and after the war. Many lament that the British .280 wasn’t adopted – and perhaps that is true, but like many ideas ahead of their time, the .280 cartridge – though sound – found it rough-going simply because the decision-makers of the time weren’t ready for it. If it had been introduced even a decade later, the reception might have been different. All of this begs the question – if the cartridge was that good, why didn’t the British-CW nations push ahead with it anyway, and tell the Yanks to “sod off” as the Brits like to say? Georgiaboy61 – It’s been a long time since I fired the SAW, but the gas system is adjustable and can change the rate of fire. I forget the exact parameters something like 600rpms to 1000. I don’t know if they train gunners to use it that way. My son adjusted his gas system and head space as necessary to get the gun to do what he wanted. He wasn’t just a gunner – he was also a mechanic on the gun, and used it for everything from longer range suppression to room-clearing. Of course, that was the USMC. I don’t know what the Army does. You are currently reading "Army Squad Weapons From Early-Vietnam", entry #20492 on The Captain's Journal. This article is filed under the category(s) Firearms,Guns,Weapons and Tactics and was published January 27th, 2019 by Herschel Smith.